Hoummous or houmous or hummus, there are almost as many ways of spelling this dish, is a healthy, vegan soup made with chickpeas and tahini. 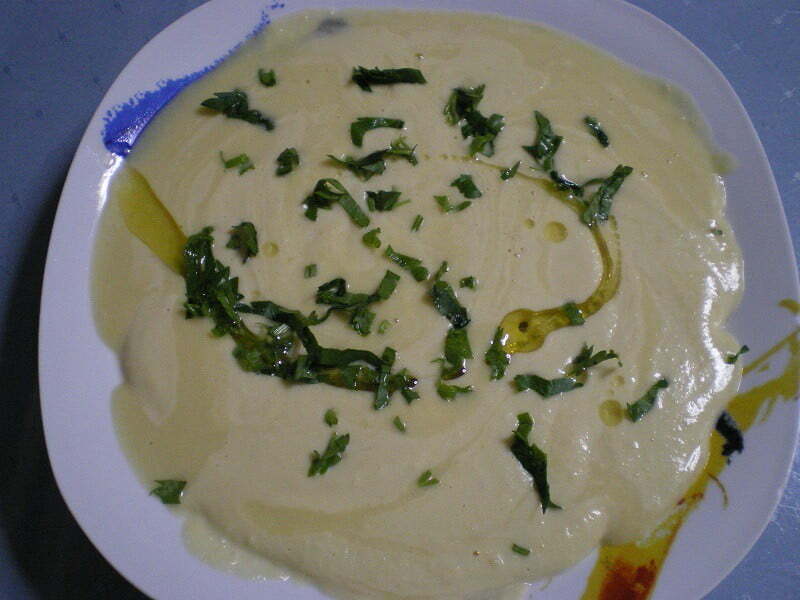 In fact, hoummous soup is made with the same ingredients as for hoummous dip. More hot broth is added until it reaches the consistency of a soup and is served with croutons. The cooked chickpeas can be freezed, so when making this soup, I usually boil more in order to make the dip whenever I like. It can be a filling lunch, when accompanied with pitta bread or croutons. Soak the chickpeas in water from the previous night. Drain and peel them. It is preferable to buy skinned chickpeas. Boil in unsalted water, skim the liquid water and drain once. Add fresh water and boil again. Add salt, lower heat, cover with lid and simmer until soft. Remove the chickpeas with some water in a bowl and allow to cool before pureeing so as not to damage the blender. When pureeing the chickpeas, heat the chickpea water again. Put a ladleful of cooked chickpeas in the blender with 1 garlic clove, (or less if you don’t like garlic) a tablespoon of tahini, a couple tablespoons lemon juice, salt and a tablespoon of olive oil. Mix and puree. Add water from the chickpeas, if necessary. Place the pureed mixture in a soup plate and add additional boiling liquid from the pan and mix together to make a soup as thick as you like. Taste and adjust by adding extra olive oil, lemon juice, salt and pepper (optional) and stir. Sprinkle with parsley on top and serve with pita bread or croutons. Hoummous soup is made with the same ingredients as for hoummous dip. More hot broth is added until it reaches the consistency of a soup and is served with croutons. The cooked chickpeas can be freezed, so when making this soup, I usually boil more in order to make the dip whenever I like. You can find this and many other Greek or Cypriot recipes in my cookbook «Mint, Cinnamon & Blossom Water, Flavours of Cyprus, Kopiaste!» both available on all Amazon stores. Read more here.